Generate Presents: Summer Social Innovation Week! Come join us in our series of social innovation events, learn new skills, meet like-minded entrepreneurs and discover how you can impact the world! 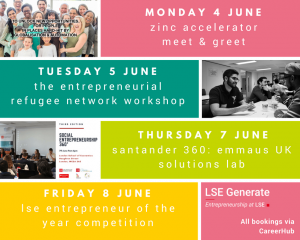 LSE Generate’s funding competition returns as this year’s winners compete for the titles of Entrepreneur of the Year and Social Entrepreneur of the Year. Book here to watch our entrepreneurs and social entrepreneurs pitch. The pitching competition will be followed by the Awards Ceremony. Are you interested in becoming an entrepreneur? Looking for some inspiration, or to see what other LSE students are up to? This is a great opportunity to learn more about student and alumni businesses. From fashion to consultancy to analytics to social enterprises, the range of businesses this year is of the highest quality. Don’t miss out on your chance to learn more about enterprise at LSE! The pitching will take place all day in Sheikh Zayed, 10-4pm. Join us on Monday to meet the Zinc team over tea, coffee and sustainable pastires. You’ll have the chance to learn more about their second mission, which aims to unlock new opportunities for people in places that have been hard-hit by globalisation and automation. This is a great opportunity to chat to the team and learn how you can get involved with their 9-month accelerator programme. 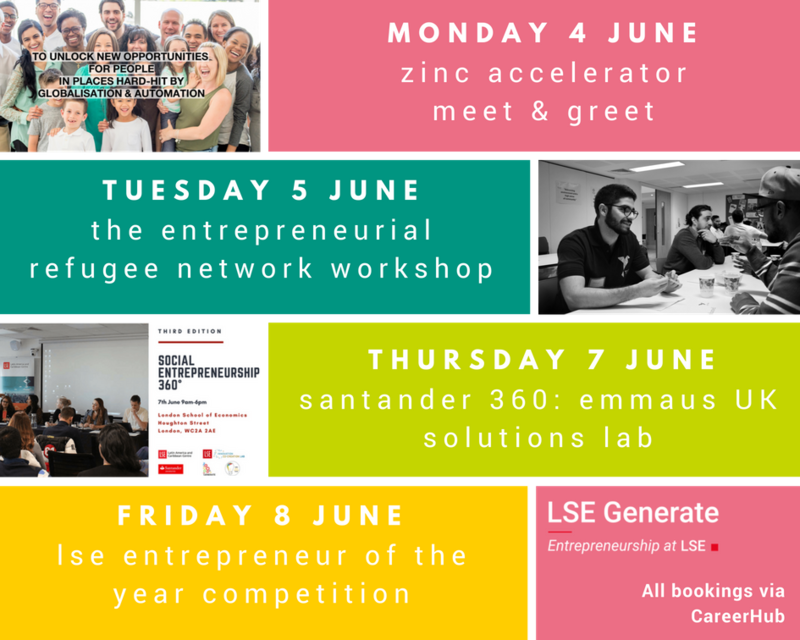 LSE Generate is excited to announce the first event in their collaboration with TERN, The Entrepreneurial Refugee Network. Founded in 2016, TERN is a pioneering new social enterprise that supports and empowers refugees in the UK to realise thei r potential, fulfil their aspirations and develop their own businesses. 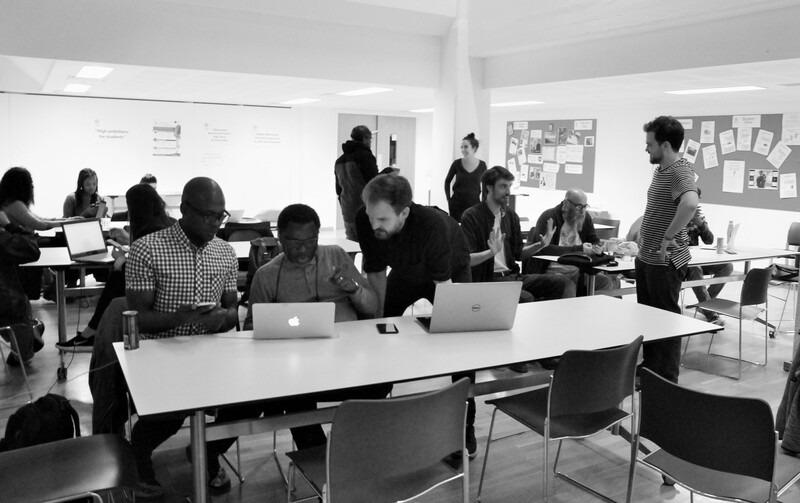 We’ll be hosting their ICE Academy ideation workshop where early-stage refugee entrepreneurs will be designing and thought mapping their business ideas. 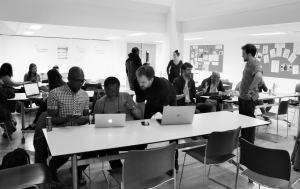 We’ll have time during the event where you can pop along and ask the entrepreneurs any questions you might have, and learn from the TERN team how you can get involved with their work. To read more about TERN’s current activities, check out their website. To let us know you’ll be dropping in to ask the entrepreneurs some questions, register on CareerHub here. The Innovation Co-creation Lab, the Latin America and Caribbean Centre and LSE Generate are delighted to jointly host its final of 3 events entitled ‘Social Entrepreneurship 360’, sponsored by Santander. 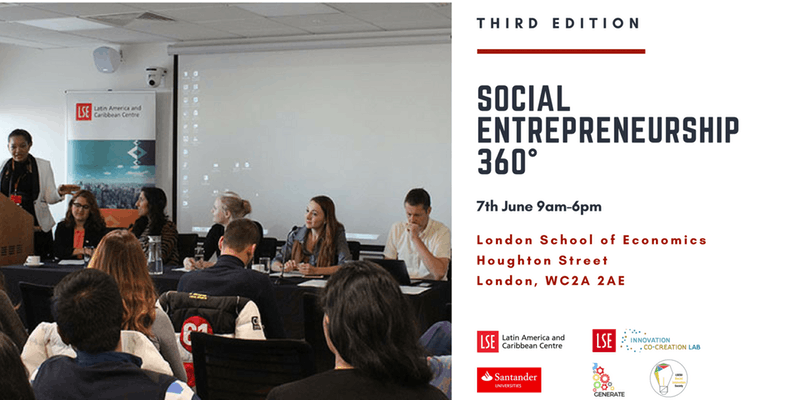 Each event addresses one of the defining movements of our time, the rise of social entrepreneurship and the practicalities of initiating, growing, building and scaling social enterprises in Latin America and other emerging markets. The final event takes place on June 7th 2018. The morning session is a panel discussion of social entrepreneurs at different stages of development who will engage with students and academics; explaining their journey, business models, ‘golden nuggets’ for success and discuss failures and lessons learnt. The afternoon session will consist of interactive boot camps and workshops, followed by a reception for participants to mark the end of a successful series. You can register for the whole day on the Eventbrite. Generate has coordinated the Solutions Lab, giving student entrepreneurs the opportunity to solve a real world problem and win a prize. The breakout session will be led by Simon Grainge, CEO of Emmaus UK and Linda Drury, Head of Business Development at Emmaus UK. The task will ask how to solve the biggest challenge facing Emmaus UK? Attendees will break into groups for 45 mins to create an innovative initiative that addresses the problem. Students will present their solutions and there will be a small prize for the best idea. Can Universities be effective agents of social change? Could you have what it takes to become a social entrepreneur?